Once you have written your post and/or made your picture, please put it up on your own blog, and leave us a link by submitting it to the GOOGLE FORM. We will add your link to the “links” page of the website. Additionally, we are hoping to build this site up as a major resource for autistic individuals and family/friends who are looking for support. As such, we would love to reprint as many of the submissions as possible as blog entries here. When sending us your link, please let us know if you give permission for your post to be reprinted here, and on the Tumblr. If so, we will reprint your post, adding the following line at the top: “From <your blog, with link>, reprinted here with permission of the author”. If you do not have a blog, and still want to participate, that’s fantastic! We have already received several submissions, and look forward to posting these and more. 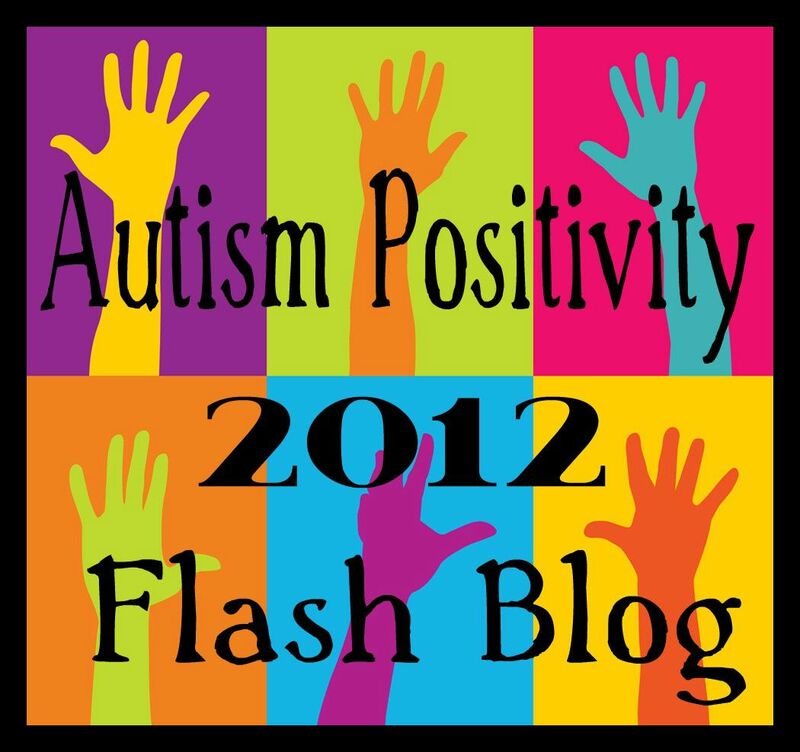 Please send your entry to autismpositivity@gmail.com and we will post it tomorrow as a blog entry here. If you have a twitter account you’d like linked, we’ll include that in the post title, so that it links to you. You can also leave it as a comment here. If you don’t have time to write, or don’t want to submit anything, but still want to participate, you can help by connecting with other social media and sharing the posts from the flash blog. As mentioned on Twitter, Asperger’s Illustrated is in and is very excited about this project! Post is written and scheduled to go up at 10 am on the 30th. For now, I’ll just link http://aspergersillustrated.blogspot.com. My son is four years old and has autism. He has taught me what love really is. He has taught me patience, empathy, kindness, and selflessness. Autistic people are not judgmental, they rarely lie, and they view the world through logical eyes. Without autistic people we wouldn’t have engineers, scientists, and safety protocol experts. Autistic traits are needed for our society to function. I understand that having autism can be difficult in a world of neurotypicals, but many people are working very hard to spread autism awareness and to teach others to be more mindful of those who have autism. Very soon in the near future everyone will know what autism is and it will no longer matter what the “norm” is. There doesn’t need to be a ” norm.” We all just need to be accepting of each other. This is so true. I have a 5 year old with Autism and this is exactly how I feel as a mom. I was diagnosed with aspergers 2002. I struggled throughout college in early 1990s and not sure if warning signs were arriving back then, but I did graduate with a C average. Autistic people, aspies and people with disabilities want respect, acceptance as we are and appreciation for their uniqueness. Though autism and aspergers affect each individual diffrently, I’m still learning what aspergers is… I know what I’ve experienced from it, but doesn’t mean I know what it is. anyhow, I want to be valued for achievements and my struggles because trying new endeavors is better than giving up and I won’t ever give up because I like learning something new every day. Autistic and aspies population like to have the same normal definition as the non-disabled and accept that we are normal in our own individual ways, not by other’s opinions what they think normal is. My brother and I would have belonged on the “autism spectrum” if such a thing had been discovered in the 1950′s. He was on the more severe end, having also problems with ADHD, etc. and social and academic difficulties. He disliked school because of teasing and name-calling, and repeating grades. He didn’t learn to read until his 2nd time in 7th grade, when purely by chance he was assigned to a wonderful teacher, Mrs. Reed – (honestly) who took the time to figure out how his way of learning was “different” from the average. Although he is still a terrible speller (has everything proofread by family members), he graduated from Vocational School, and has had a successful career in building and contracting, has been a Volunteer Firefighter and Fire Chief in his town, is a first responder in climbing and ice rescues, and is a free-lance excavator, pole setter, and lighting rigger for large concert venues. He’s been married for 24 years, and has a son who is a robotics ace. Pretty good life for one who started so slowly. I myself would have been a “high-functioning Asperger’s child.” I loved school, learned to read at age 3 1/2, and despite bouts of extreme shyness, depression, anxiety and panic, (which have never entirely disappeared), made a so-so adjustment to social situations, got good grades, and found my niche in music and education. Aside from stage fright, which prevented any kind of solo or conducting career – (“they have an App for that now”) -I have been a life-long orchestra and band member, taught music for over 40 years (all ages & levels, and 15 years as a teacher of Music History at the University level) with a Master’s Degree in Music, and also earned a Master’s degree in Library Studies. I had a very happy marriage, and am helping to raise my 3 lovely (bonus) grandchildren. My “alter ego” is an outdoorsy person – I love camping, hiking, road trips, and am handing many of these life-skills down to my grandchildren. So, another success story. I hope these will give parents hope for their “different” children. I am so glad that you shared this here as well as on 30 Days of Autism. I suppose that is what we wish all of our children. I am a 44 year old woman who would have been diagnosed with “high-functioning autism” as a child growing up in the 1970s England. I too was extremely shy, withdrawn and felt personally alienated from my peers whom I could never relate to or socialize with (despite my mother’s well intended attempts). I learned to cope and compensate throughout my life, overcoming a learning disability (I can only retain the first 1-2 instructions) by becoming observant of myself and how I learned (I am a visual learner and process new information quite differently). The most amazing thing is that I have all my memories from childhood in vibrant colours when triggered by one of my senses, and can be in a past memory here and now as a movie playing, simply by producing the picture in which I formed the memory – if I was interested and paid attention or it was traumatic and I had no choice but to imprint it. I have taught myself to spell, even write and be inspiring. I still find it difficult to read and retain printed words but my imagination creates stories to help me. I am thankful that I wasn’t diagnozed and labelled during my childhood; I might never have come as far as I have in life! me, too! I can smell a particular fragrance; never know what it is, but it’s one that’s been around for awhile and popular with teachers, and it takes me straight back to the halls of second grade with apprehension, anticipation and all of those feelings of school and a new grade level. Having Aspergers isn’t easy to live with for anyone, although being a Spectrum condition, some people with Aspergers (seem to) cope better than others – but for all we know those with Aspergers who seem to be coping well (which usually just means better than us) may go home every night and weep! The fact is that you do have Aspergers and that isn’t going to change. The wording of your search inquiry suggests two things. 2. By definition that you are probably sufficiently intelligent to understand what this means, or at least to be able to find out what this means. Not everyone who has Aspergers realizes that they have Aspergers. At the very least, learning that you have Aspergers gives you an opportunity to clear up some of your confusion, perhaps a lot of confusion. You can choose whether or not you take that opportunity, an opportunity that others with Aspergers don’t have and may never have. The psychological stages following the diagnosis of Aspergers (self diagnosis or formal diagnosis) can be something like this, although not necessarily in this exact order. People with Aspergers tend to be more interested and more talented in the physical world rather than the social world, there are exceptions. So while those with Aspergers may not be suited to working as a Maitre d’, or a Wedding planner, they are often very well suited to vocations in the physical world, in some cases much better suited than those who do not have Aspergers. The ranks of Science, higher Academia, Engineering, Information Technology, the traditional ‘professions, composers, writers, artists, actors, film directors and producers, musicians and inventors are awash with those who exhibited clear and strong Asperger traits. You are in good company. I would encourage you to work at getting to the acceptance stage of having Aspergers, perhaps with professional help, because Aspergers is going to continue to be your life long companion and non-acceptance will not make Aspergers disappear. I would then encourage you, to spend time discovering your passion, (you may have discovered this already) and then to follow this passion using your unique gifts and perspectives, whatever your stage of life happens to be. Thank you Leah. It took me a while to get the words out. I wanted to contribute a post that would provide guidance and encouragement without preaching or lecturing and as you commented too, without being full of platitudes. The Flash blog posts so far have been great and fittingly a real Spectrum of experience and perspectives. My post is up, as it is the 30th in Australia! Fantastic! Thanks 🙂 Would you be interested in allowing us to reprint your post (in its unedited entirety) on this site as well? We would link it back to you, of course. 🙂 Let me know! Hi! I’m in Australia, and it’s the 30th here, so I’ve posted! Fantastic – Thanks, Michelle! I’ve added yours to the queue of posts!! Fantastic! I can’t wait to read it. 🙂 Once it’s live, I’ll add it to the links page. Fantastic! Thanks 🙂 Be on the lookout for it tomorrow morning! Post is ready to go tomorrow. I love this movement! My blog is http://www.autism-island.com and I would also love to join the Autism Positivity Project. I believe deeply in this idea! Also, my post is going up tomorrow and I would love for you to repost it here. I’m proud of the post and the movement! Ooops. First comment didn’t post. I have a post going up at http://www.autism-island.com tomorrow morning. I love this movement. Also, I would love to join the Autism Positivity Project if your looking for new members! Sorry about that! I hit “approve” but after your other comment… hate it when the internet eats comments. Anyhow, if you’re looking to help, please share the posts far and wide! 🙂 If you have a twitter, we’ve designed them so they’ll post well to twitter (hopefully).. and blogs/facebook/other social media sharing is super great. Visibility is what we need 🙂 Thanks so much for your support and interest! I’m sending you an email with the post now and I will share everywhere I can. Thank you for this! I am passionate that I want my daughter to always know she is wonderful just as she is. Fantastic! 🙂 I’ll add you to the queue. My post is now up! Absolutely! Thank you guys so much for organizing it! Fantastic! I hope not to be awake then either… however when I get up tomorrow morning, you’ll be added to the queue. 🙂 Thanks so much, and I can’t wait to read it! Here’s mine! You have permission to repost. Thanks for doing this! My post is up: http://profmomesq.wordpress.com/2012/04/30/profmomesq-to-i-wish-i-didnt-have-aspergers-autismpositivity2012/ I sent an email as well, but just in case, please feel free to reprint with a link back. And, thank you so very much for the unbelievable organizational effort that went into (and is going into) this project. Beautiful! Aspiprof (http://aspiprof.blogspot.com/) supports this great initiative! Here’s mine 🙂 http://coloursandsmoke.wordpress.com/2012/04/30/anthea-to-i-wish-i-didnt-have-aspergers-autismpositivity2012/ Happy for you to repost if you wish. I blogged my positivity post here: http://sandyquill.com/2012/04/30/sandi-layne-to-i-wish-i-didnt-have-aspergers-autismpositivity2012/ Please feel free to share, if you wish. Great. Has anyone suggested gathering all these posts together for a book? I would love to read lots more of them, but sometimes its more comfortable to read a real book in the garden, on the sofa or in bed than sitting in front of a screen. Just an idea! I adore the Flash Blog Project! I am always humbled by the Autism community and love our social media presence. Here is my post, you have permission to re-publish if you wish. I sent an email with the link to my post on Emma’s Hope Book, but am doing again here http://www.emmashopebook.com/a-letter-to-you-who-wrote-i-wish-i-didnt-have-aspergers/ as I forgot to say, yes please repost in it’s entirety and use as you like. So happy to see the amazing turn out already and it’s only 9:30AM! Howdy! I’ve just written my contribution – http://wp.me/p19r05-1V . Of course, you can repost it, as long as you link back to me. I’m glad to see loads of posts! Epic! I have my post up at my site: http://aquietweek.com/ My post link is: http://aquietweek.com/2012/04/30/a-quiet-week-in-the-house-to-i-wish-i-didnt-have-aspergers-autismpositivity2012-flash-blog/ I am honored to be amongst so many passionate members of our community and grateful to you for coming up with this lovely idea. Posting just a few minutes before midnight on the 30th here in Australia 🙂 Oh and please feel free to share / repost. I’m not sure if my comment disappeared, so sorry if I duplicate! I blogged, rather at length! Please feel free to share or repost. Didn’t disappear – just stuck in moderation! Thanks for your amazing post. 🙂 It will be reposted here later today. Thanks so much! May we reprint it on this main site? Wonderful job E! I am so appreciative of all of your hard work on this site. My entry is at http://inneraspie.blogspot.com/2012/04/inner-aspie-to-i-wish-i-didnt-have.html . You also have my permission to re-post. Thank you! Thanks, Jen! May we reprint your post on this site? 🙂 Adding you to “links” shortly. Fantastic, thanks so much for participating! May we reprint your post on this page? Looks like you are having a wonderfully busy day! Please feel free to share/repost. Thanks for organizing such a great event! You certainly may reprint it with attribution if you so desire! Feel free to repost here. Awesome idea! So great to do something POSITIVE!! http://www.thecrowdednest.blogspot.ca. I give permission for it to be reprinted here. I cannot begin to say how moved I have been by the posts and comments I have read here. I am the parent of several kids with aspergers. I saw that you blogged “I wish I didn’t have Aspergers.” This made me a little sad. I don’t know you, but I suspect that what people call “Aspergers” in you is what makes you special and what will make you a success in life. I don’t want you to give up before you find this out! I hope you don’t mind my guessing about what makes you tick. I suspect that you have at least one great passion in your life, something that interests you so much that you would go to the ends of the earth to figure it out. Does this make you a little different? Yes. People without Aspergers divide their interests a lot of different ways. They don’t achieve the level of knowledge you have, and they don’t get the excitement you have in discovering the truth about what interests you most. Does this make you weird? No. It is what can make you a great person! Abraham Lincoln, Henry Ford, Albert Einstein, Benjamin Franklin, Bob Dylan and Bill Gates are considered as examples of Aspergers. Probably some of their friends thought they were weird in their time, but it didn’t stop them from following their goals until they reached them. You won’t hear a word about their friends, but you admire these people for their life achievements. I have one son who loves trains. He can identify any kind of train when it goes by. I have another who loves studying firemen and policemen. I am glad for them, because they have a passion they follow that makes them happy! Everybody should have this. Don’t let anybody put you down because you are not like them. Follow your dream wherever it leads you, and remember there are many people who think you are special, and will be proud of you for what you do with your life. I love that you are doing this. What an uplifing project! Thanks! 🙂 You’ve been added to the queue. Thanks for doing this, I think it’s awesome! Absolutely, I would be honored! Here is my entry, written by my 13 year old daughter who has autism and a learning disability. Its her take on what it means to have autism and a learning disability. It made me cry with pride. You may reprint this on the site. Thank you so much to both you AND your daughter. That was beautiful 🙂 You’ve been added to the links and the reprint queue. No kicking necessary – thanks for giving me the link explicitly! Helps tons 🙂 Shall I repost here as well? Hi – I love this idea. Thanks for creating it. Here is my post: http://aspectsofaspergers.wordpress.com/2012/04/30/the-happy-aspects-of-aspergers/ Feel free to share/repost. Beautiful, just beautiful. Thanks so much for participating! I have 2 questions for you… question 1: what is the permanent link to that post, so I can put it in the “links” tab. And question 2 – may we reprint it here on the main website (linking back to you, of course.) Thanks! Mine is pretty late.. I had a busy day and this was kinda hard to write, to be honest. Also, feel free to reprint it if you so choose. Of course you may!!! Thank you for being one of the organizers! I love the idea! Hi! Can you add my blog to the list? It’s http://trydefyinggravity.wordpress.com thank you for this wonderful idea! Oops! Note to self: don’t write anything without coffee first 🙂 thank you so much! !